Below is a video of a 2012 Camaro ZL1 modified by Redline Motorsports based in Florida. The modifications consist of a larger ATI drive pulley and a smaller LPE supercharger pulley to increase boost, and a ported blower snout. The stock LSA camshaft which has 198/216-degrees of duration and .492/.480-inches of lift was replaced with a custom Comp Cams camshaft which has 231/248 degrees of duration @ 50 degrees. The Comp cam was mated to 7.400-inch long pushrods and Redline’s double valvesprings with titanium retainers. The stock exhaust manifolds were replaced with American Racing’s long tube headers with 1 7/8-inch primaries. From the headers back, Redline installed an X-pipe and high-flow cats while keeping the balance of the exhaust stock. The ZL1 also received a cold air intake, larger heat exchanger, a set of Injector Dynamics 98 lb/hr (at 68psi) injectors and NGK TR6 spark plugs. The car still maintains its stock 1.9 L blower, stock block and stock heads. To help get the ZL1 out of the hole, Redline fitted it with a high stall torque converter and Mickey Thompson drag radials. On the day of the 10.23 run, it was hot and steamy in South Florida. The temperature was approaching 90 degrees and the density altitude (DA) was in excess of 2000 feet. 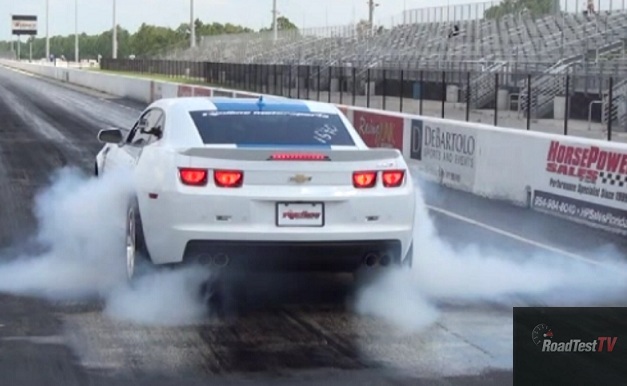 Clearly, this ZL1 is a 9 second car in better conditions.